For Individual Use only. Please purchase multiple quantities at checkout for multiple viewers for home, business, or educational use. Thanks! In about the time it takes to watch a movie, you can learn each Apple topic from AppleGrad Video Tutorials. Our mission is to teach you the important and need-to-know features. This means you can learn quicker, without the fluff that can add hours and confusion to the process. Conveniently download the video tutorial to your Mac or Windows PC. Watch the tutorial in iTunes or QuickTime Player with Chapter Navigation. 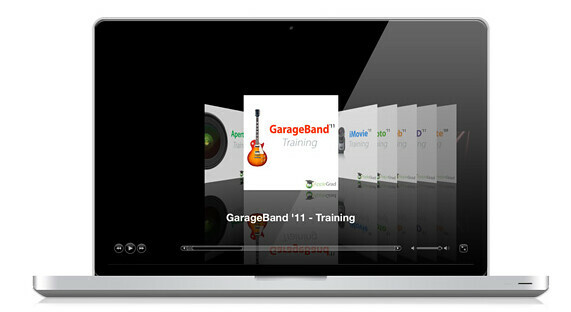 You can also sync the video tutorial in iTunes to your iPad, iPhone, iPod Touch to learn on the go (see requirements). During the entire learning experience, you don't have to leave your home! No subscription, expiration, or login required! • Download and watch on a Mac or Windows PC in iTunes or QuickTime Player. • Presented in 720p High Definition. You can clearly read what is being instructed on screen! • Includes Chapter Navigation. Conveniently replay any section at any time. • No subscription, expiration, or login required. Watch as many times as you want. • Sync via iTunes to watch on the go on your iPad, iPhone, iPod Touch (see requirements). • Video Tutorials are DRM-free 720p .m4v files. Click any of the above titles to view the Course Outline and Watch a Preview! "It was really convenient to download the training video and learn from my home." – Lisa M.
"Terrific! Will do business again, if there is another tutorial I want. Thank you." – Wanda B. "Love it, the training helped me with my own films with tricks I never knew how to do." – Luis R.
"Everything from the download to learning Final Cut was just great!" – Mary S.
"I will definitely purchase more in the future. Great product! Blazing fast service!" – Chris P.
"Purchased and downloaded within 30 minutes! I learned what I wanted to and started working on my own projects afterward. Thank you!" – Kaye W.
• A Mac or Windows PC to download the video tutorial. • A high speed internet connection is required for downloading, not required for playback. • Watch on a Mac or Windows PC in iTunes or QuickTime Player. • Sync via iTunes to watch on your iPad (gen 1+), iPhone (gen 4+), iPod Touch (gen 4+). • Due to the size and number of files it is recommend to download only 1 tutorial at a time. • Approx. 10 GB total download size. Tutorials are individual downloads, not one large file. I already have most of these, and some that are not offered here, like Final Cut Studio training videos. These training videos are a great reference to fall back on and convenient as you actually have the training video downloaded on your hard drive. Is there an offer to get only certain training videos? And are any of these training videos updated? For example I have iTunes 10, but as you know iTunes 11 is out. @RJphotovideo – Thanks for the kind words about my video tutorials! This offer is the best deal I’ve ever done! It’s even better than the deals I run on the AG website. The tutorials are available individually at the site. There are no current deals individually (check back on macZOT and our site for future deals). If updates are made to the tutorials it gets announced in our monthly email newsletter, twitter, and facebook. For current release tutorials, those updates are free for customers. For releases like iPhone iOS 5 Training to iPhone iOS 6 Training, those are discounted paid upgrades for customers. I haven’t released a new iTunes Training yet, so I removed it from the site. In this macZOT bundle deal, the iPad Training is from last year. So when an updated version comes out it will be free to all macZOT buyers of this deal!